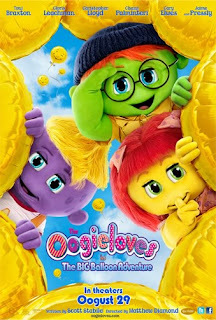 DnBuster's Place: ARE YOU READY FOR THE OOGIELOVES? It’s a beautiful day in Lovelyloveville. It’s Schluufy’s birthday and the Oogieloves (Goobie, Zoozie, and Toofie) along with their friends J. Edgar, Windy Window and Ruffy, are organizing a party (Ssshh! It’s a secret). Everything is going along just perfectly until J.Edgar trips and loses the last five magical balloons in all of Lovelyloveville - OH NO!!! The Oogieloves immediately take action and set out to find the magical balloons in time to save their friend’s party. Along the way the they meet some very interesting characters indeed, including Dotty Rounder, Bobby Wobbly, Milky Marvin, Rosalie Rosebud and Lola and Lero Sombrero . Can these new friends help them recover the magical balloons and get back to the cottage in time to celebrate Schluufy’s surprise birthday? Theaters and showtimes are NOW available on Fandango.com and Movietickets.com. Put in your zipcode and start planning for Oogust 29th TODAY! At opening day every child gets a fun wand that glows in the dark -- it really helps make the film more of a family musical event than a regular 'ole movie! 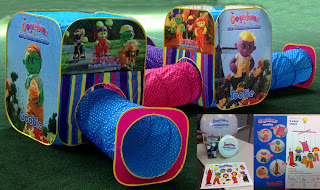 Just in time for the opening of The Ooglieloves in The Big Balloon Adventure I have a giveaway for some great prizes, including a tent! Prize package is valued at more than $150! These are the cutest!! I love them!